Making money doing what you love in a jaw-dropping workspace with passionate like-minded people is the dream, right? Let me introduce you to WeWork. WeWork is an international membership-based workspace share for freelancers and small-business owners. Their mission is to make small businesses more successful by inspiring creativity in a space where meeting people and collaborating is organic. In just 3 years, WeWork has gone from a concept to more than 15,000 members in 26 locations and counting. WeWork spaces are accessible by keycard 24 hours a day and 7 days a week. Amenities include fully furnished work spaces; fast, reliable internet; free coffee and fruit; lounge areas; frequent workshops and events; conference rooms; outdoor spaces; editing bays; recording studios; screening rooms; event spaces; writers' rooms; print services; mediation rooms; and much more. Membership also includes access to the WeWork online community, where you can connect with other small-business owners outside of your own city. WeWork has also leveraged the size of their company to offer great health insurance plans to their members, which is a major perk. These spaces range from $325-$600/mo. for a lab desk to $525-$950/mo. for a private 1-person office. Prices go up for multiperson offices. These flexible month-to-month spaces are absolutely beautiful and so flexible for a growing business. Once you become a member, you have access to offices in every city. In Washington, D.C., alone they have 3 locations in Chinatown, Shaw, and Dupont Circle. I stopped by the Shaw location, located in the historic Wonderbread/Hostess Factory and voted one of the world's coolest offices by Inc. Magazine. This 33,000-sq. foot, 2-story, uniquely designed space was absolutely beautiful and bustling with activity. While waiting in the lounge/kitchen area with a complimentary fruit-infused water, I couldn't help but notice two large glass-pained garage doors that opened onto the expansive outdoor patio. The patio was beautiful and modern and had large and small tables to work outside. There was so much natural light and so much activity happening in just that one area. After the tour started, I walked through the hallways lined with individual glass offices branded with each businesses logo, and I was able to catch a glimpse of companies hard at work. There were event planners, photographers, web developers, designers--all with various sized spaces. According to my tour guide, a lot of companies had started with a small space and had expanded at WeWork, some now even occupy 16-person offices. There are currently 300 small businesses, the majority of which are creative businesses, that operate out of the Wonderbread facility, and it's growing quickly. 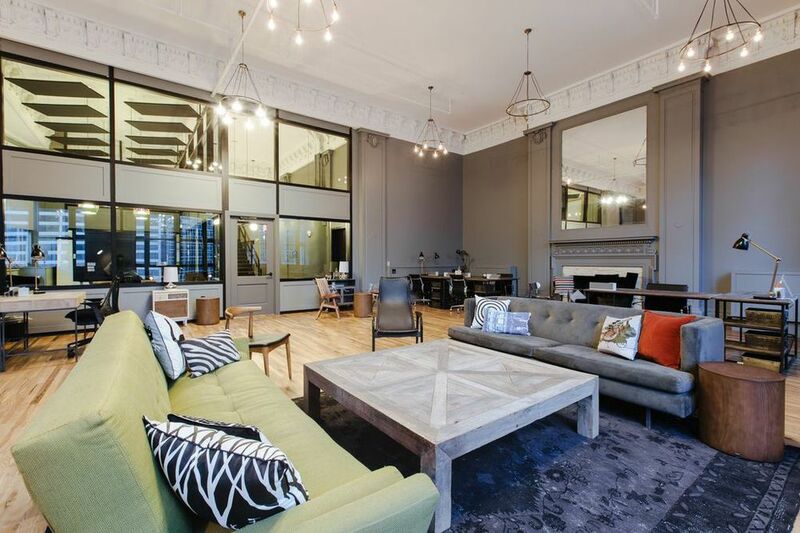 WeWork is so much more than stunning offices. It's space, community, and services that help propel you to build a sustainable business doing what you love in a fresh, exciting way. Typecase Industries is a letterpress and design studio founded by three close friends and based in Washington, D.C. In addition to producing custom pieces for their clients, they design and print posters, cards, and coasters, which are available at select shops, at craft shows, and in their Etsy store. If you aren't familiar with the process, letterpress is a centuries-old printing technique where inked plates with raised text and graphics are pressed into paper. This transfers the ink to the paper and creates a beautiful recessed imprint. This printing technique is very popular for wedding invitations and high-end cards. I had the opportunity to tour Typecase Industries' NW studio, which is located in the 52 O St Artist Studios and home to a variety of other creative business owners. Alessandra and Emily showed me around, gave me a sneak peek of some ridiculously beautiful wedding invitations, and talked me through the letterpress design and printing process. If you're interested in learning more about letterpress or other old school techniques, these ladies teach workshops out of their studio on Wood Type Printing, Linoblock Design/Printing, and Bookbinding. These 5-hour classes are beginner-friendly and include lunch. Typecase Industries will have a booth at the Crafty Bastards Arts & Crafts Fair at Union Market in Washington, D.C., on September 28th. If you aren't local, their prints are available for purchase through their Etsy store. For information on their workshops, contact Alessandra for a schedule. It's so inspiring to see these passionate ladies turning what they love into a creative and successful business. Keep up the great work!